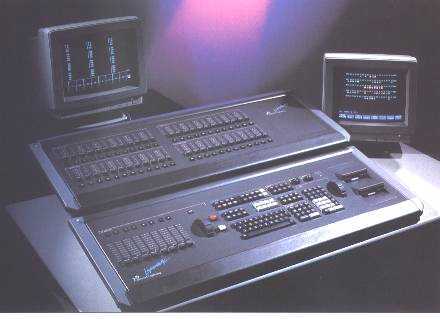 Range of two high specification memory control consoles. Light Palette® 90 controls up to 1536 channels, 1536 dimmers. 24 or 48 fully overlapping, individually programmable submasters. Programming of submasters by flash button. The Light Palette® method of operation uses a command line of instructions, entered through the logically-positioned keypads and used to memorise and perform the most complex lighting states, changes and special effects in a simple and fast way. Light Palette® 90 offers the highest level of facilities with options of desk configuration and expansion, for large scale lighting installations. The system comprises a double-tier desk with 24 or 48 submasters and dual 3.5" disk drives, plus a separate electronics tower. The electronics tower connects between the main desk and dimmers, and also accepts the input from optional peripherals such as designer's consoles, hand held remote controls, printer and an automated lighting control computer. A dual electronics system is also available to provide full-tracking backup. System capacity is 1536 channels proportionally patched to a maximum of 1536 dimmers connected by three DMX512 multiplex ports. The Designer's console is a duplicate control desk in a single tier configuration, which may be connected to the single tier submaster outrigger desk (24 or 48 submasters) and two monitors for simultaneous control at the production desk during rehearsal. Light Palette® 90 is supplied as a complete system with double tier console, single-electronics tower, two monitors for up to 512 dimmers plus cables and handbook. Expansion to 1024 or 1536 dimmers, peripherals, and accessories are ordered separately.